My Guest Blogger Wedding Gift Wrap Design for Nashville Wraps. I have always loved themed gift wrap — it is an unexpected way to decorate a gift and just makes people smile. I was walking by a tuxedo rental store at the mall and saw all of the styles of tuxes shown on the wall as options to choose from. 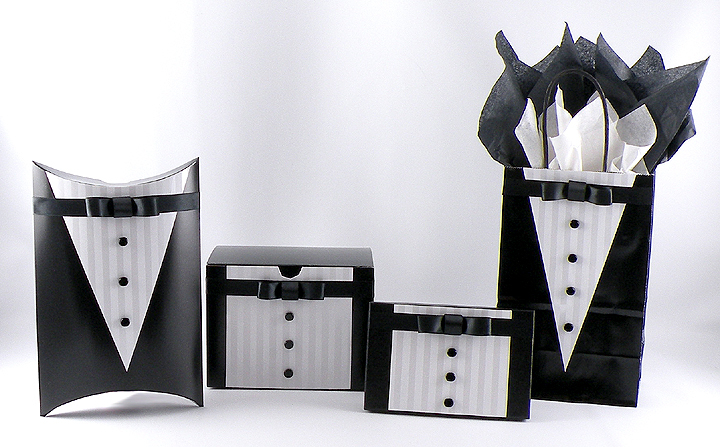 I was instantly inspired to create a gift box design perfect for a groom or groomsmen using a tuxedo as the presentation. 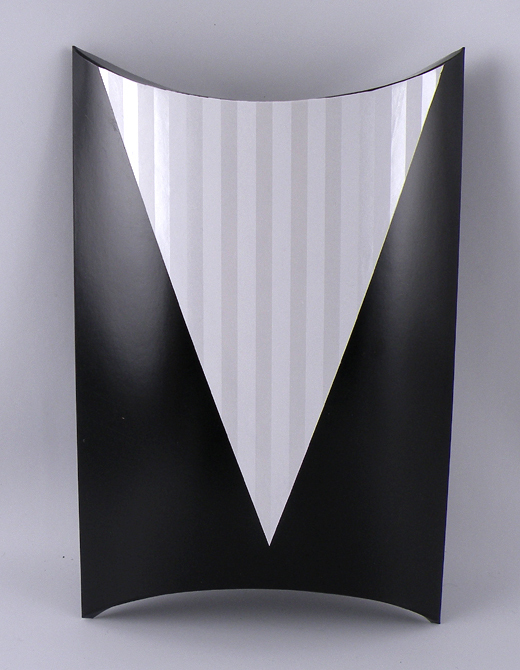 It is easy to create this look and will hold any type of gift with Nashville wraps large selection of black boxes. 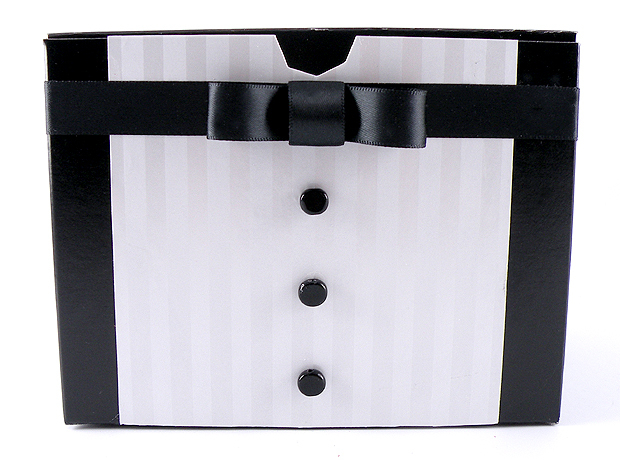 The Pearl Stripe Gift Wrap looks like an expensive tuxedo shirt and the Double Faced Satin Ribbon gives the bow tie a crisp and classic style. I finished the design with black shiny beads to simulate buttons. I have created the Black Tie gift design so any of these styles shown can be reused after the gift it open — this also allows for the gift wrapping to be in done in advance. 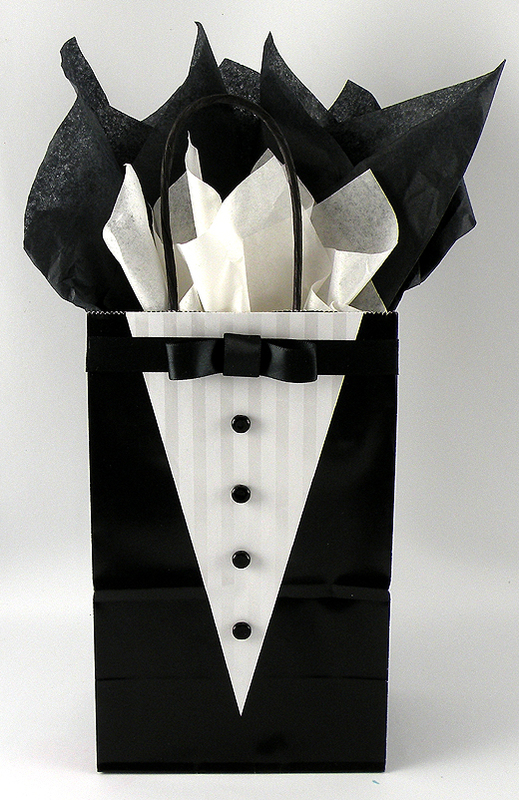 They will not only dazzle any wedding party but also add sophistication to a black tie gala event. This bow tie design will work on any size of the Nashville Wraps black boxes, gift bags or pillow boxes for the Black Tie design. I used 5/8” BLACK Double Faced Satin Ribbon. 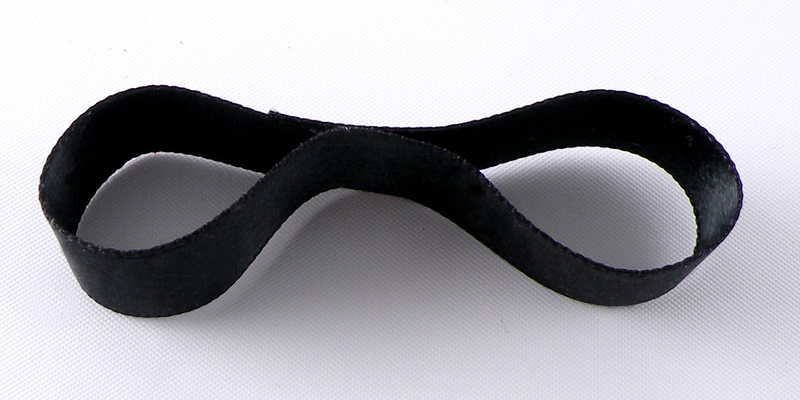 Step 1: Cut a 6-inch piece of black satin ribbon. Fold the ends to middle, overlapping about 1/4 inch, and glue to form a loop. Step 2: Apply glue to the inside center and press together to form two loops. Step 3: Cut a 2-1/4 inch piece of ribbon and place the right side of the double loop bow face down on to the piece of ribbon. Step 4: Apply glue to each end of the ribbon piece and fold over to form a bow. 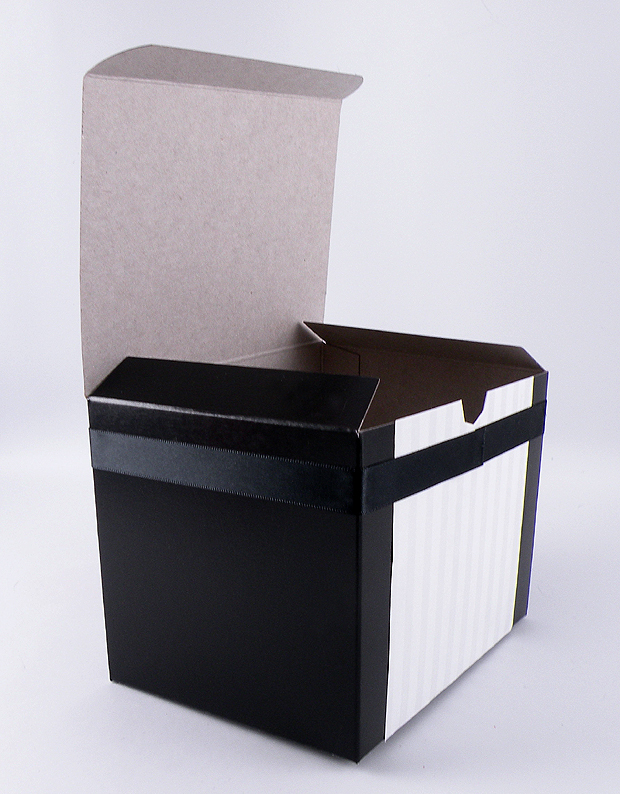 The Black Jewelry Boxes are very sturdy and can be saved and can be reused after the gift is opened. Step 1: Cut a piece of the Pearl Stripe Gift Wrap 1-1/2 inch smaller than the width and the entire length measurement of the lid of the box. Step 2: Apply glue stick to the wrong side of the wrapping paper, especially around the edges. Attach the craft paper to the top of the lid, centering the paper evenly. 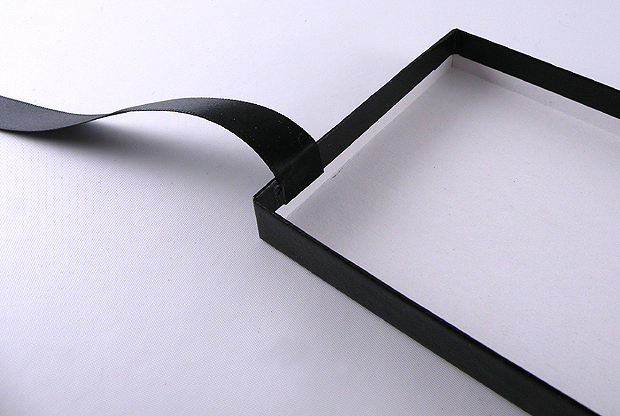 Step 3: Cut a piece of the black satin ribbon the length of the top and sides of the lid of the box plus 1 inch. Step 4: Glue one end of the ribbon 1/4 inch from the long end of the box on the inside of the lid (as shown above). Step 5: Attach the remaining length of ribbon around the top of the lid with craft glue, securing the other end on the inside of the lid. Step 6: Glue the bow onto the center of the black satin ribbon and attach three black beads, evenly spaced, on middle of the box directly centered under the bow to complete the design. 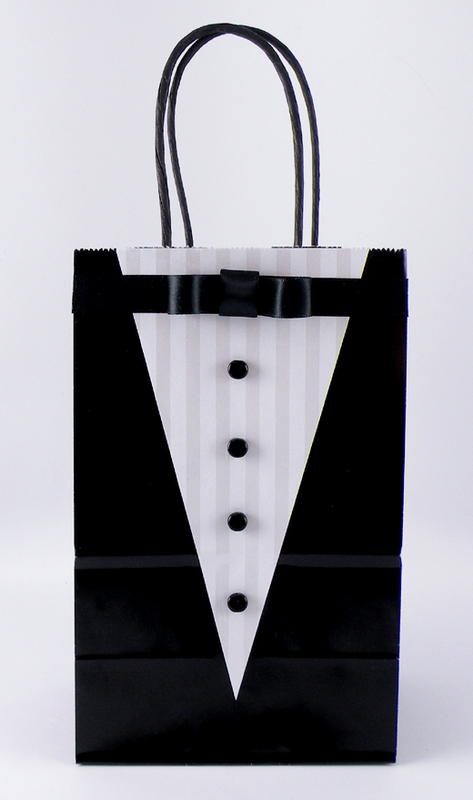 This Black Tie gift bag is a very elegant design — the layered tissue paper adds height to the presentation that makes it look extra fancy. Step 1:Cut a piece of the Pearl Stripe Gift Wrap 1 inch smaller than the length and the 1 inch smaller than width of the front of the gift bag. Step 2: On the wrong side of the wrapping paper, mark the center of one of the short edges and draw a line from each of the corners on the opposite short end to the center mark to form a triangle. Cut along the lines. Step 3: Apply glue to the wrong side of the craft paper especially around the edges. 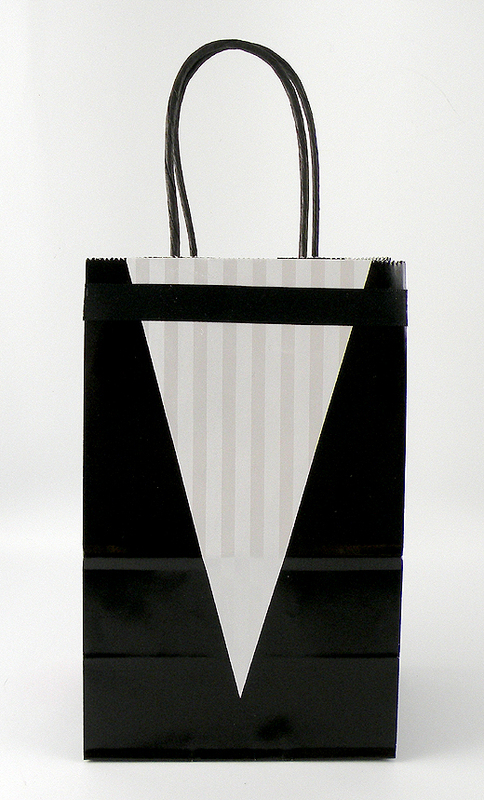 Attach the paper to the front of the gift bag, lining up the edges of the paper with the top edge of the bag. 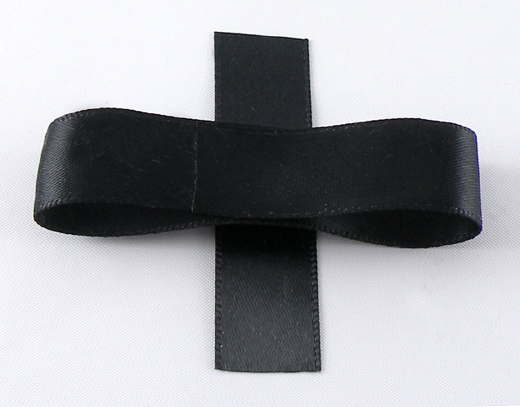 Step 4: Cut a piece of the black satin ribbon the entire width of the front of the gift bag. Glue the ribbon to the front of the gift bag 1 inch from the top. 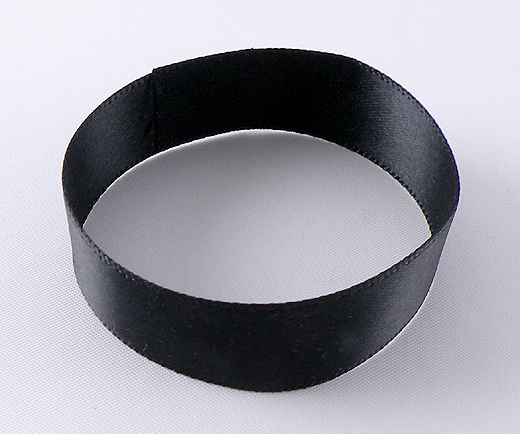 Add small amounts of glue to the cut edges of each side of the ribbon to prevent fraying. Step 5: Glue the bow onto the center of the black satin ribbon on the top of the bag and attach the 4 black buttons, evenly spaced, on middle of the bag directly centered under the bow. 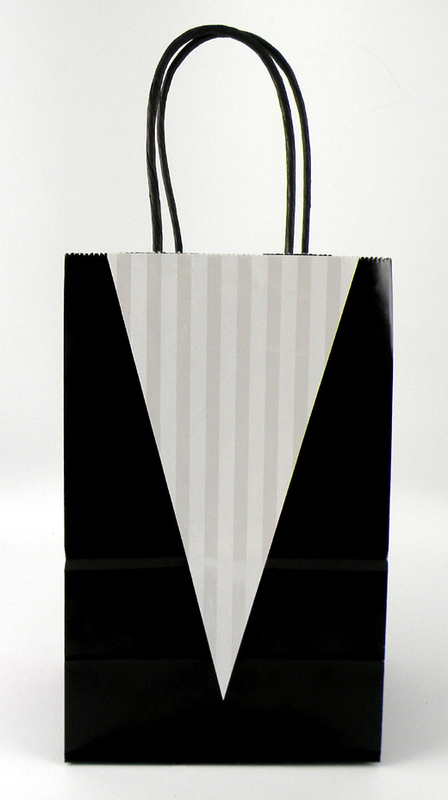 Step 6: Fill the bag with layered black and white tissue paper to finish the design. 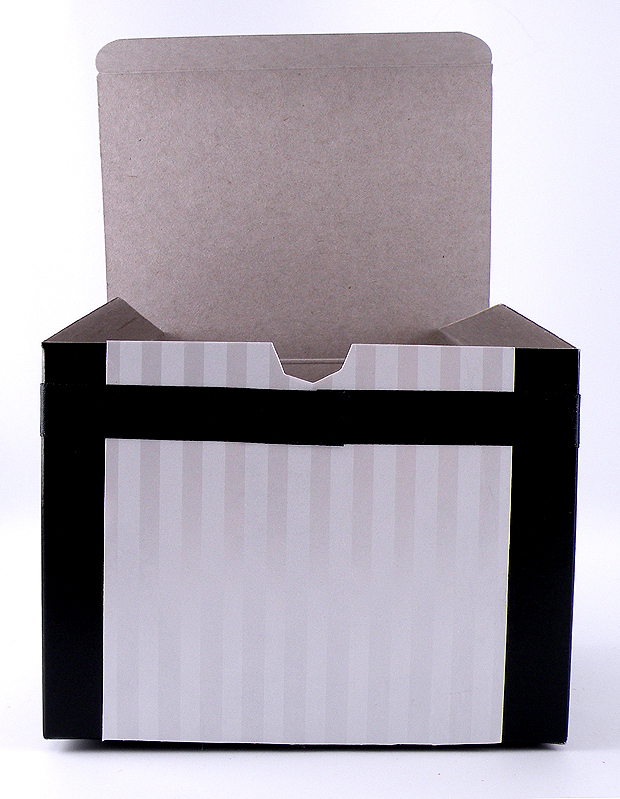 The Black Gloss Gift Boxes are easy to decorate and are a great way to display your design. 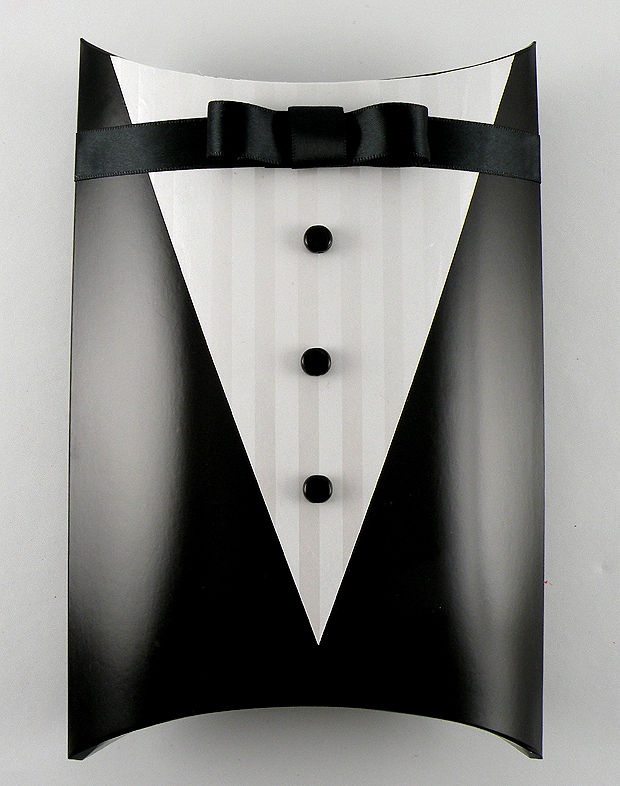 I like to place the tuxedo on the front of the box so it can be seen from across the room. 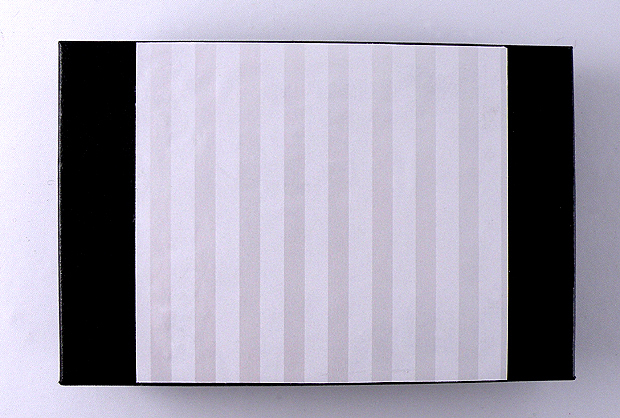 Step 1: Cut a piece of the Pearl Stripe Gift Wrap 1-1/2 inch smaller than the width of the front of the box and the length measurement of the front of the box. Step 2: Apply glue stick to the wrong side of the wrapping paper, especially around the edges. Attach the wrapping paper to the box, centering the paper evenly on the top of the box. Step 3: Cut a few slits in the paper where it meets the front notch of the box and fold in, gluing the extra flaps of paper on the inside of the box. 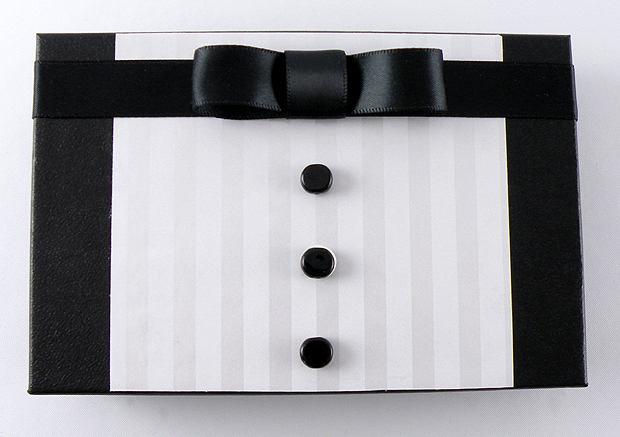 Step 4: Cut a piece of the black satin ribbon long enough to wrap around the entire box plus 1 inch. Attach the piece of ribbon around the box, 1 inch from the top and glue the overlapping ends on the front center of the box. Step 5: Glue the bow onto the center of the black satin ribbon and attach the 3 black buttons, evenly spaced, on the front of the box, directly centered under the bow. 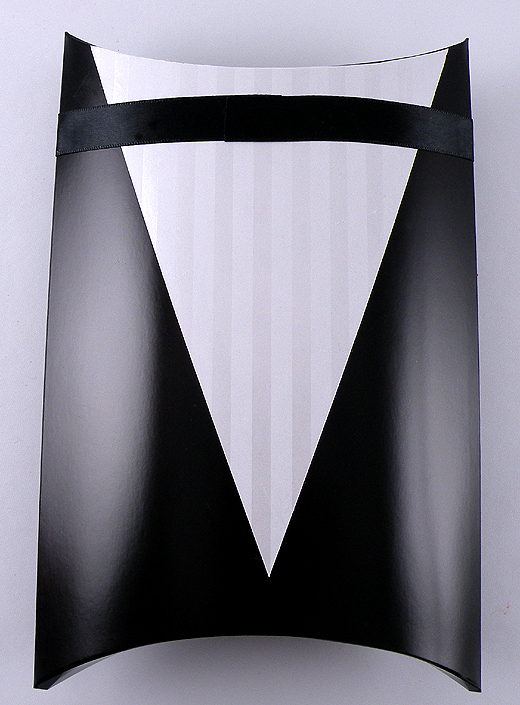 The Black Tie design on the Pillow Box is super cute because the curve on the top of the box resembles the neckline of the tuxedo shirt. Step 1: Cut a piece of the Pearl Stripe Gift Wrap 1 inch smaller than the length and the 1 inch smaller than width of the front of the pillow box. Step 3: Apply glue stick to the wrong side of the wrapping paper especially around the edges. 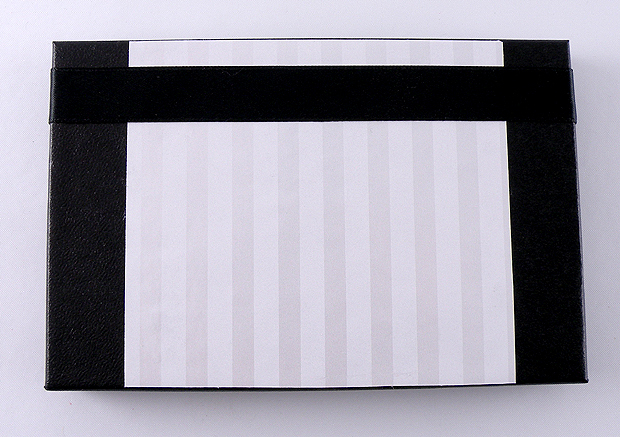 Attach the paper to the front of the pillow box, lining up the edges of the paper with the top edges of the pillow box. Step 4: Trim the top edge of the wrapping paper to match the curve of the box. Step 5: Cut a piece of the black satin ribbon long enough to wrap around the entire pillow box plus 1 inch. Wrap the piece of ribbon around the box, ½ inch from the top and glue the overlapping ends on the front center of the box. Step 6: Glue the bow onto the center of the black satin ribbon and attach the 3 black buttons, evenly spaced, on middle of the bag directly centered under the bow. This entry was posted in Gift Wrapping, gifts, wedding and tagged Black Tie, gifts, Gina Tepper, Nashville wraps, tuxedo, tuxedo gift wrap, Wedding Gift Wrap, wedding gifts, wedding presents. Bookmark the permalink.